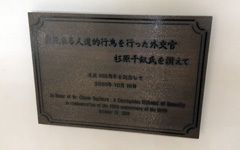 Sugihara's definition of 'humanity' as realizedby 'helping those in trouble' stemmedfrom his benevolent nature and Japanese sense of dignity.His thoughts and actions make us proud to be Japaneseand urge us to become individualsthat will continue serving othersin the midst of difficulties. Sugihara was born into an average family in 1900 and grew up in an ordinary environment. He had dreams of becoming an English teacher and studied hard to achieve his goal, but financial difficulties arose and halted his studies. He redirected his efforts to passing the examination for exchange students which would gain him a position as a diplomat and allow him to study at the government's expense. He managed to pass the exam and was accepted as a trainee in Russian, thereby pointing his life in a new direction. 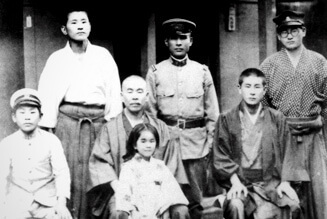 The Sugihara Family (Chiune: back row center). His potential abilities were recognized in Harbin and he began his promising career as a diplomat there. At about that time, Hitler had risen to power as the Nazi dictator in Europe and was endangering the lives of the Jewish people. 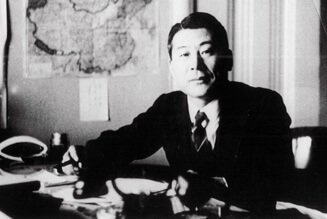 Sugihara during his tour at the Manchurian Foreign Office. Sugihara was sent to Kaunas in Lithuania to open a Japanese consulate there and to simultaneously gather information about the Soviet Union. This was about the time when Hitler's persecution of the Jews had intensified, leaving them with scant destinations for escape. "May I issue visas?" In return, he received a disheartening reply with the order, "Do not issue visas to anyone who cannot follow proper procedures." 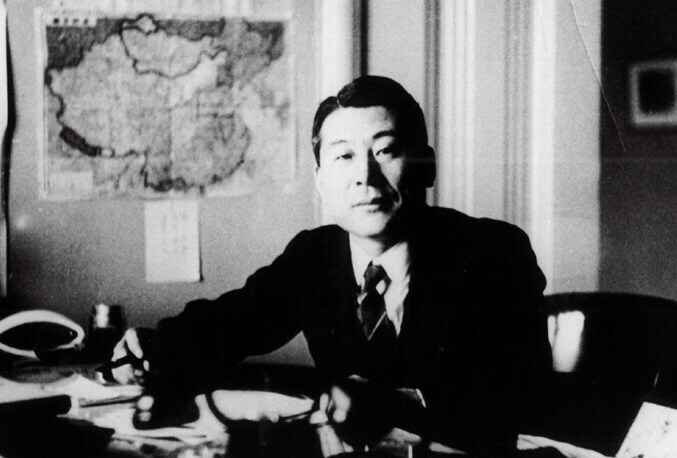 Sugihara was torn between the choices of issuing the visas and saving Jewish lives and following orders which would allow him to protect his spotless career as a diplomat. He struggled for an answer before coming to a decision. 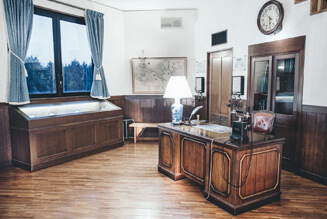 Period replica of the office where the life and death decision was made (Hall). Upon his return to Japan in 1947, Sugihara was fired from the Foreign Ministry for issuing the visas against orders. A Jewish person who had been saved with one of his visas visited him in 1968. 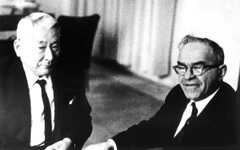 The man pulled out the tattered visa Sugihara had crafted and wept as he voiced his thanks. 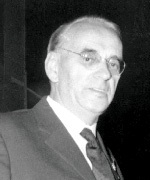 With ex-Religious Party Minister Warhaftig (1960). 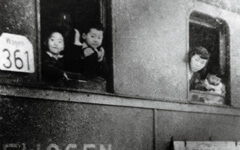 Chiune's work and his fateful encounter with Jewish refugees. "The Soviet Union national economy report". a valuable paper written by Chiune at the age of 26. His excellent ability to inform and analyze drew the attention of the Foreign Ministry in Japan. 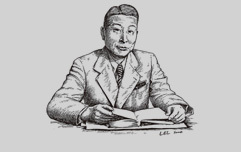 Why did Sugihara take action? While persecution of Jews kept escalating and the number of Jewish refugees increased, the number of countries willing to open their gates to them was limited. Moreover, as the war escalated countries in Southern and Western Europe also turned refugees away. 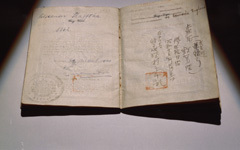 On the morning of July 18th, 1940, Jewish refugees from German-occupied Poland gathered at the Japanese consulate in Kaunas right before it was closed down. They were seeking transit visas to Japan. 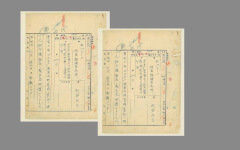 The conditions for receiving a transit visa included money (to travel to and from Japan, and for the stay itself) and a visa to a final destination, which the refugees did not have. 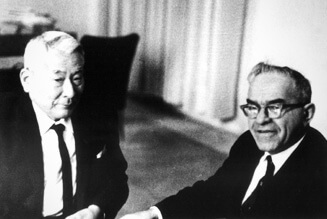 Sugihara had to consult the foreign ministry for instructions. 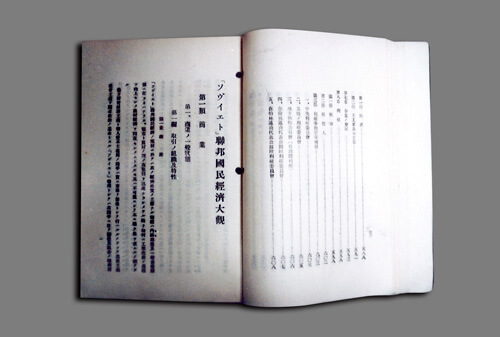 The ministry ordered him to follow the rules and issue visas only to those who met the terms, but Sugihara ignored the orders and issued transit visas to everyone without any conditions at all. 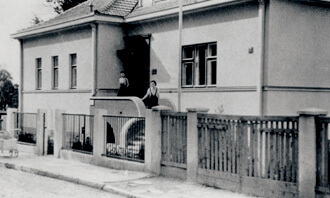 The Japanese consulate in Kaunas, where Chiune was appointed consul. 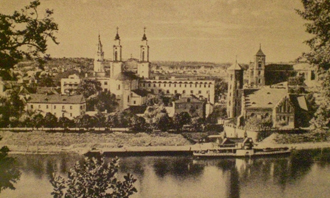 A view of Kaunas, the capital of Lithuania at the time the Japanese consulate was there. Ministry of Foreign Affairs telegraphic documents. What caused the refugees to flee Lithuania? the invasion of Poland in anticipation of the annexation of the three Baltic States, their reach was already being extended. 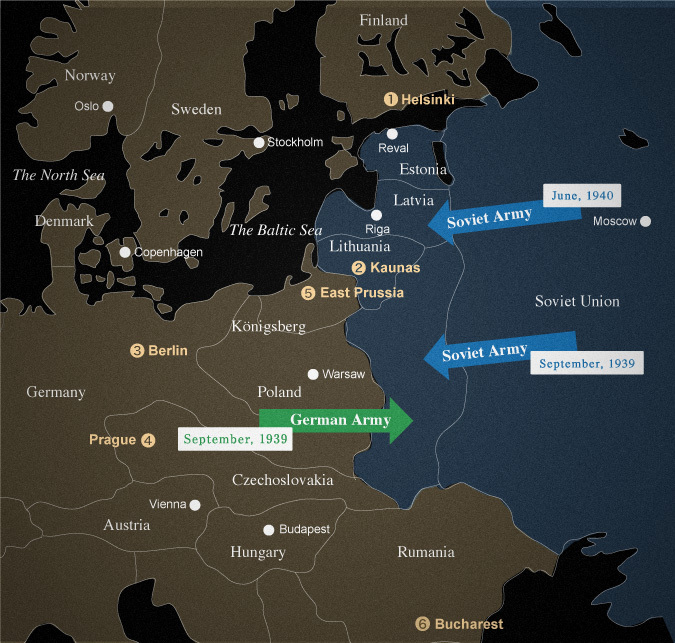 In October 1939, the Soviets entered into a Mutual Defense Agreement with the three Baltic States, allowing them to position their military within them and unilaterally broke the agreement the following year in June of 1940 while flooding them with soldiers and thereby making Lithuania a part of the Soviet Union. ※?〜? on the map show the locations in order where Chiune Sugihara served as a diplomat in order. Why did Sugihara issue the visas? To tell the truth, I thought about it all night.After struggling and agonizing,I concluded that humanity is paramount.Then, fearing nothing,I decided to issue those visas. 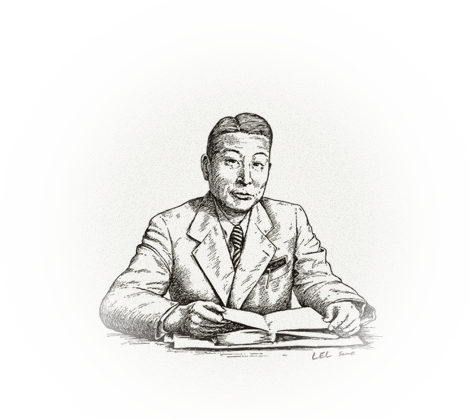 Then he issued the visas…Once Sugihara made up his mind,he started writing. 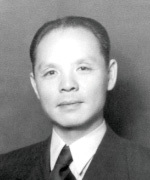 During the following month he spent all his time issuing as many transit visas to Japan as he could, in order to save as many lives as possible. He kept writing visas even after leaving the consulate to stay at a nearby hotel. At last, the day came for him to leave Lithuania. 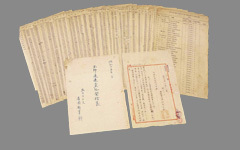 Sugihara continued writing visas for the Jewish refugees who followed him to the train station. He handed the last visa out through the carriage window, just before the train left the station… During that month, he had issued 2,139 "Visas for Life". What route did the refugees use to escape? at Vladivostok and landing at Tsuruga. After disembarking there, they traveled in Japan, passing through. In a world of total moral collapse, there was a small minority who mustered extraordinary courage to uphold human values Just like Sugihara, these people were non-Jews who risked their lives to save Jews without any financial gain. They saw them simply as human beings, and felt obligated to help them as such. The Israeli govern- ment awarded these people the honorary title "Righteous among the Nations". As of 2014, these men and women number 25,271. Zwartendijk was a Philips' repre- sentative who took on the position of Acting Dutch Consul in Kaunas, Lithuania. He is- sued Jewish refugees quasi-visas to Curacao. Those "visas", together with the ones issued by Sugihara enabled the Jews to leave Lithuania and survive. After Austria’s annexation by Nazi Germany in March 1938, Ho Feng-Shan issued 1,900 visas to Shanghai for Jews who wanted to flee. He did so in spite of his superior's orders. Some refugees reached Shanghai through Siberia; others used the visa to travel to other destinations. 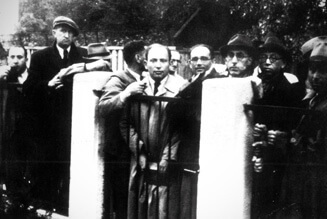 When Germany invaded Belgium and the Netherlands on May 10th, 1940, the Government of Portugal prohibited the entrance of refugees, especially Jewish refugees, to its territory. 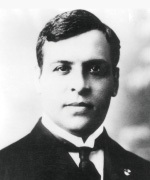 Sousa Mendes disobeyed his country's instructions and issued visas to tens of thousands of refugees including thousands of Jews. He also made sure they crossed the Spanish border post safely. 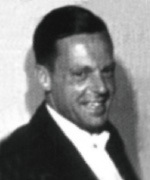 Lutz was the first diplo- mat of a Neutral country to save Jews. He saved the lives of thousands of Jews by is- suing them Swiss safe-conduct documents and setting-up safe-houses for them. 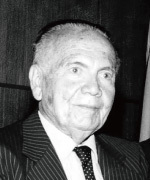 When the Germans began the deportation of Rhodes' 1,700 Jews to Auschwitz in late July 1944, Ulkumen demanded the release of Turkish citizens and their families. He managed to save the lives of 42 Jews. Copyright (c) YAOTSU TOWN (Japan) All Rights Reserved.